Can you confirm these amateur observations of Bothrocophias microphthalmus? Type locality: Between Balso Puerto and Moyabamba, Peru. Synonymy: Lachesis pleuroxanthus has been synonymized with Bothrocophias microphthalmus by most recent authors (e.g. Campbell & Lamar 2004, Wallach et al. 2014). However, the NCBI taxonomy still has an entry for Bothrops pleuroxanthus (taxID 157557), based on an unpublished study by W. Wüster (submitted in Aug 2000. Taxonomy: SCHÄTTI & KRAMER 1993 didn’t justify their allocation of microphthalmus to Porthidium, hence it has been assigned to Bothrops by some authors (W. Wüster, pers. comm.). 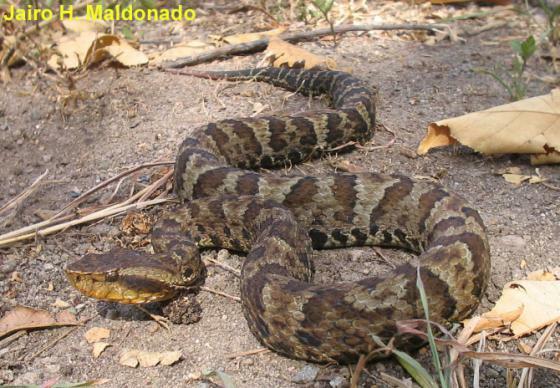 Subspecies: Bothrops microphthalmus colombianus has been elevated to species status.